This year, Canada remembers our country’s great contributions and sacrifices in the First World War. 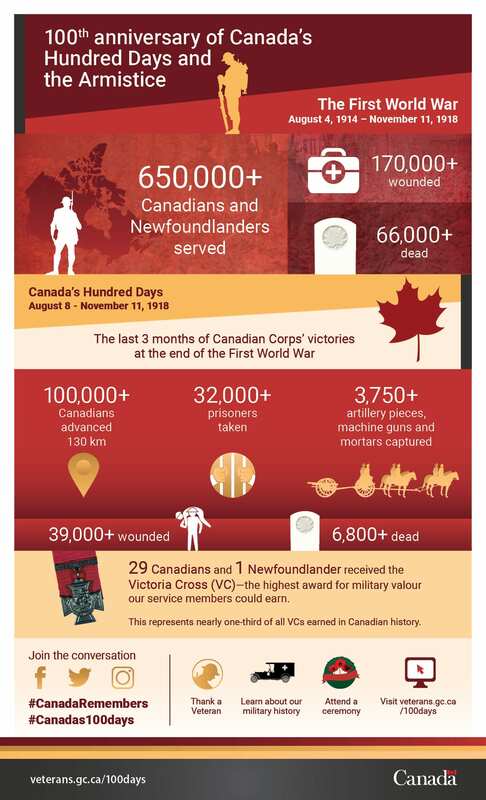 Our many achievements on the battlefields of Europe were capped by a three-month stretch of victories at the end of the war – August 8th to November 11th, 1918 – that came to be known as “Canada’s Hundred Days”. 29 Canadians and 1 Newfoundlander received the Victoria Cross (VC)—the highest award for military valour service members could earn. This represents nearly one-third of all VC’s earned in Canadian history. Every year in November, we stop to remember, salute and honour Canada’s Veterans and active duty personnel. This year, we hope that Canadians from coast to coast to coast will join us to pay tribute to our heroes for their service and sacrifice. Let’s start a social media movement that tells our Veterans that #CanadaRemembers.